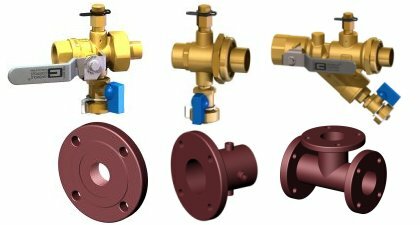 Griswold Controls offers piping components like isolation ball valves, unions, and y-strainers that can be used to create custom coil piping packages. Griswold Controls has expanded our offering of these components to include larger accessories components like flanges, flange adapters and tees to build larger air handling unit packages. Griswold Controls also offers accessories like combination air vent and pressure temperature test valves, automatic air vents, pressure temperature test valves, hoses and drain valves.